Project Fi, which is being renamed "Google Fi" alongside the expansion of the service, is designed to provide hassle-free cellular service with perks like international data coverage at an affordable price. The Google Fi service is priced at $20 for unlimited talk and text, along with $10 for each GB of data used up to 6GB. At the 6GB cap, data becomes free, and at 15GB, data speeds slow down. The monthly fee caps out at $80, not including taxes and fees, and it costs an additional $15 per person. On the iPhone, LTE data speeds, unlimited texts, and unlimited calls are included, and there are no roaming fees in more than 170 countries. There are, however, some restrictions. While iMessage functions fine, sending texts to non-iPhones requires configuring some settings, and voicemails will not be able to take advantage of the visual voicemail feature in iOS. Voicemails will instead be available as text messages, and you'll need to call to check them. Google Fi's network switching feature and VPN do not work on iOS. Google Fi operates as an MNVO, aka mobile virtual network operator, which means its coverage comes from other carriers like T-Mobile, US Cellular, and Sprint. Google devices are able to take advantage of network switching for better coverage, but this does not work on iOS. iPhones and iPads will instead use T-Mobile's network for calls, texts, and data, but international roaming is still available. Calls or texts cannot be made over WiFi with Google Fi, and when outside of the U.S., the data hotspot feature will not work. You could previously get Fi service on an iPhone in an unofficial capacity using a SIM card activated by a Google device and changing some settings, but Google now offers official Google Fi support on the iPhone. 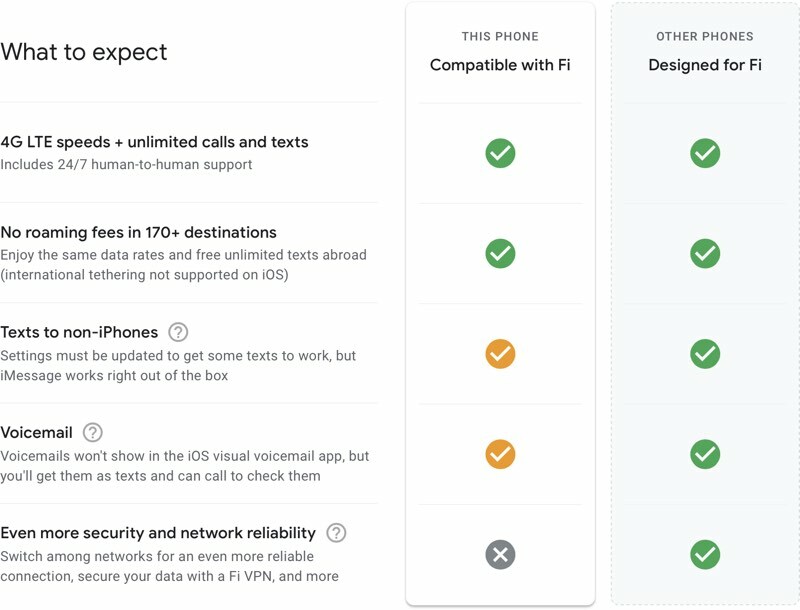 Google says the Fi service will work with the iPhone 5s and later, with iPhones required to be running iOS 11 or higher. For today only, Google is offering a travel credit when purchasing a Google phone, or a $200 Fi service credit when bringing a phone to Fi. What a coincidence; it just so happens I'm starting a cellular service of my own! AngerFi will guarantee full bars everywhere. Making the switch is easy: send over your first $30 payment, wait 2–3 business days to receive a SignalEnhancer, and apply it directly to your device! What a coincidence; it just so happens I'm starting a cellular service of my own! AngerFi will guarantee full bars everywhere. Unlimited talk, text, and data, but you might notice a slight issue with the call volume and we throttle like a mother ****er. To those of you reading this, the AngerFi is an absolute rip. I had to resend an MMS six times, then when it finally sent I got a text from an anonymous number which said "thanks for the nudes". I can only IMAGINE the stuff Google harvests from you. They don't go into any business without slurping some of your data. That's their entire business model. Seem a bit of a rip off to me. I get unlimited everything including taxes from Tmobile for $85 iPhone, iPad and a Series 4 watch. So basically apples works up down left right to keep their devices as private as possible, and yet people happily jump to google at the first opportunity. Yeah but if you use Google Assistant, this is really useful. Remember those phone conversations you had and you're thinking, "damn, what did we talk about again?" Luckily they'll have that information stored, so it's great for a scatterbrain like me. Yea Im sure, probably not the only data they are keeping either. Seem a bit of a rip off to me. I get unlimited everything including taxes from Tmobile for $85 iPhone iPad and Series 4 watch. So it's basically $80/month for 6gb of data. Not a great deal. Edit: Nevermind, I mis-read the article. Data becomes free from 6gb-15gb, but slows down after that. Still not that great of a deal. Verizon is $80/month for 1 line of unlimited and doesn't throttle you until 22gb. Yea but does Verizon have international data at no charge and free SMS globally?